Khalid S, Khalid M, Zaheer S, Ahmad I, Ullah E. Kirner’s Deformity Misdiagnosed as Fracture: A Case Report. Oman Med J 2012 May; 27(3):237-238. A 13-year-old boy was referred to the Radiodiagnosis department for X-ray of bilateral hands from the Orthopedic outpatient department. He presented with bilateral deformities of the little fingers noticed by him three years back. He was being treated by a local practitioner as a case of fractured distal phalanges, but the patient consulted our college because he felt the deformity was gradually progressing. The deformity was not associated with pain, swelling, or redness. There was no history of any local infection in the little fingers. He was otherwise healthy. Also, no history of similar deformity in any one of his siblings or family members was revealed. There was no extension into the DIP joint. Lateral view showed palmar bending of the diaphysis of distal phalanx (Fig. 2). Treatment modalities were discussed with the parents. As the deformity was painless, observation with periodic follow up was chosen as the modality of treatment. 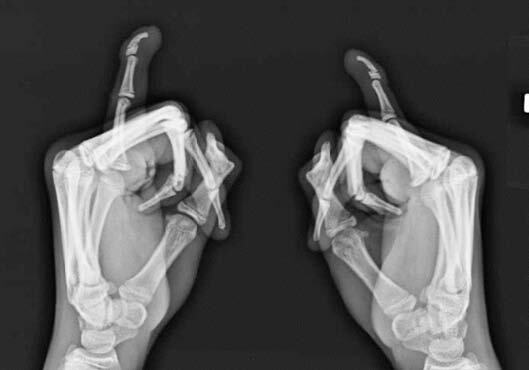 Figure 1: X-ray of bilateral hands (AP view) shows ventro-radial angulations of the terminal phalanx with an apparent overgrowth of epiphysis on the palmar surface and a tiny bony spur. Figure 2: X-ray of bilateral little finger (lateral view) shows palmar bending of the diaphysis of distal phalanx. Kirner`s deformity or dystelephalangy was first described by Kirner in 1927.1 It is a rare but usually bilaterally occurring bony deformity. Literature concerning this deformity is sparse as only a few cases have been reported in the medical journals. Etiopathogenesis of Kirner’s deformity is still not well understood, with hypotheses being juvenile osteomalacia, aseptic necrosis,4 and osteochondrosis of possible vascular origin.5 More distal insertion of the flexor digitorum profundus tendon along the palmar surface has also been proposed as a cause.6 However, systemic causes seem unlikely. 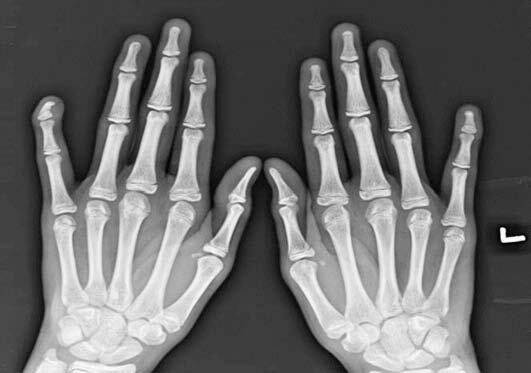 Deformity needs to be differentiated from other similar deformities such as clinodactyly (radial deviation at the DIP joint) and camptodactyly (flexion deformity at the PIP joint). Radiological findings are consistent, diagnostic and usually straightforward as in our case. There is ventro-radial angulation of the terminal phalanx relative to the middle phalanx with an apparent overgrowth of the epiphysis on the palmar surface and a tiny bony spur. A radiolucent nidus of 1-2 mm may also be seen in the terminal tuft. The articulation of epiphysis with the middle phalanx is usually preserved. As the patient’s age progresses, the diaphysis regains its width and trabecular structure, but usually 10-50 degrees of the deformity persists. No spontaneous resolution of the deformity has been reported. Awareness of this rare entity is a must to avoid misdiagnosis, as in our case. Assurance and observation with periodic follow-up is needed in most cases. No conflict of interest and no financial assistance was taken for this case. 1. Kirner J. Doppelseitige Verkrummungen des Kleinfingerendgliedes als selbstandiges Krankheitsbild. Fortschr Geb Rontgenstr 1927;36:804. 2. David TJ, Burwood RL. The nature and inheritance of Kirner’s deformity. J Med Genet 1972 Dec;9(4):430-433. 3. Sugiura Y, Ueda T, Umezawa K, et al. Dystelephalangy of the fifth finger--Dystrophy of the fifth finger. J Jap Orthop Assoc 1961;34:29-33. 4. Freiberg A, Forrest C. Kirner’s deformity: a review of the literature and case presentation. J Hand Surg Am 1986 Jan;11(1):28-32. 5. Taybi H. Bilateral incurving of the terminal phalanges of the fifth fingers (osteochondrosis?). J Pediatr 1963 Mar;62:431-432. 6. Benatar N. Kirner’s deformity treated by distal detachment of the flexor digitorum profundus tendon. Handchir Mikrochir Plast Chir 2004 Apr-Jun;36(2-3):166-169. 7. Sugiura Y. Polytopic dystelephalangy of the fingers. Pediatr Radiol 1989;19(6-7):493-495. 8. Nils C, Eiken O, Sweden M. Kirner`s deformity of little finger. Case Report and Proposed Treatment. J Bone Joint Surg 1970;52-A:1963-1965. 9. Lee FA. Generalized overconstriction of long bones and unilateral Kirner’s deformity in a deLange dwarf. Am J Dis Child 1968 Dec;116(6):599-603. 10. Kaufmann HJ, Taillard WF. Bilateral incurving of the terminal phalanges of the fifth fingers. An isolated lesion of the epiphyseal plate. AJR 1961;86:490-495. 11. Iwasaki N, Terashima T, Minami A, Kato H. Congenital dorsally curving deformity of the distal phalanx of the little finger: case report. J Hand Surg Am 2010 Sep;35(9):1502-1505.